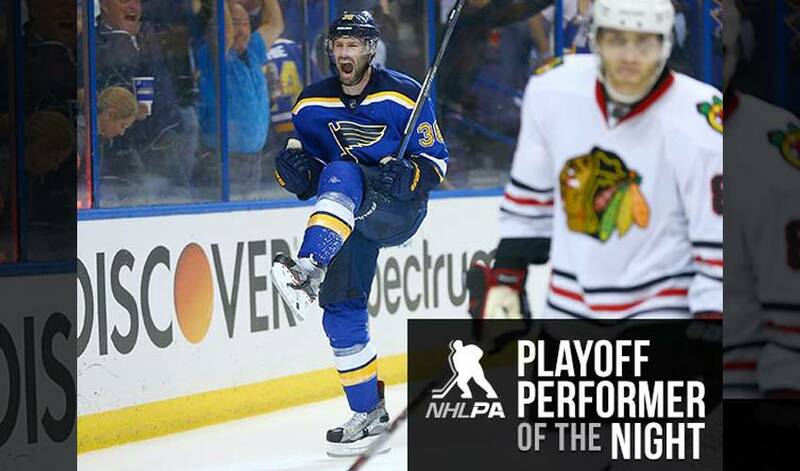 St. Louis forward Troy Brouwer nets PPOTN honours for his series-winning goal in Monday night’s 3-2 win over Chicago in Game 7. The veteran sent the Blues to the second round – where they’ll face Dallas – with his eighth career postseason tally. STAT PACK: Brouwer also had one blocked shot, six hits, was a plus-1, registered one takeaway, and took 28 shifts in 18:13 of ice time. REMEMBER ME? : Brouwer won a Stanley Cup with Chicago 2010. Last night’s game was his seventh career Game 7. His winner came at 8:31 of the third period. THORN IN THEIR SIDE: Brouwer, who appeared in 238 regular-season and 43 playoff games with the Blackhawks, scored his second career game-winning goal against his former team. The first was during the 2015 NHL Winter Classic, where he scored with 12.9 seconds remaining in regulation to lift the Capitals to a 3-2 victory. MOOSE ON THE LOOSE: Brouwer had a standout Western Hockey League career with the Moose Jaw Warriors. In 2005-06, as team captain, he scored 49 goals and recorded 102 points, winning the Bob Clarke Trophy as the WHL’s top scorer. PERSONAL FAVES: Brouwer’s favourite TV show is ‘Modern Family’ and his favourite sport, other than hockey, is golf. HONOURABLE MENTIONS: Brian Elliott made 31 saves in the Blues’ win. Robby Fabbri and Paul Stastny assisted on Brouwer’s goal. James Neal had a goal and an assist as Nashville beat Anaheim 3-1 to force Game 7. Pekka Rinne made 26 saves for the Predators. Troy Brouwer doesn't get as much attention as some of his high-profile teammates, but his play and contributions at key times in the 2010 playoffs have helped the Blackhawks reach the Stanley Cup Final.